Real GDP Per Capita — Dead! Why do I get the eerie feeling that we’ve gotten nowhere in the last four years? The answer is because we’ve gone precisely nowhere with Obama. As the chart above displays, on a per capita basis, real gross domestic product has declined by a cumulative -0.20% during Obama’s four-year term (through Q1 2012). President’s Ronald Reagan and Bill Clinton both inherited rather weak economies. Each achieved real GDP per capita growth of 1.52% in the first year in office, but by the second year, Reagan’s cumulative GDP had declined to -1.35%, while Clinton’s rate climbed to 4.34%. Yet by the end of the fourth year, Reagan’s policies resulted in cumulative GDP per capita growth of 8.47%, versus Clinton’s 8.19%. Man, whatever Reagan was onto needs to be codified and replayed, over and over and over again. Needless to say, both were overwhelmingly re-elected. George W. Bush inherited a really crummy economy. 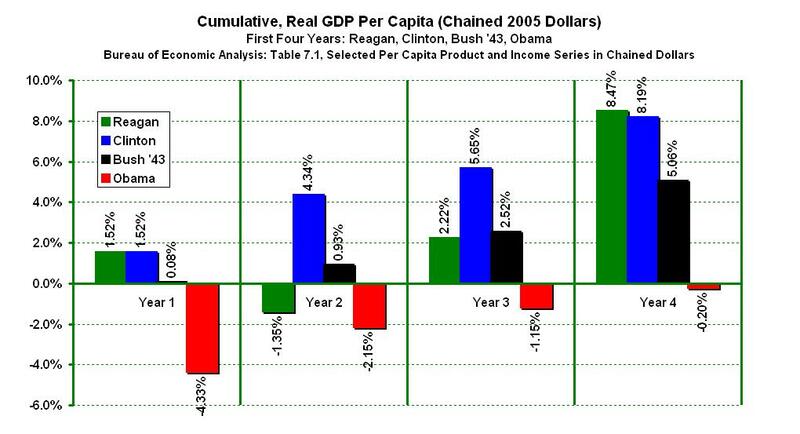 After only achieving real per capita growth of 0.08% in his first year, by his fourth, Bush’s policies had grown the economy to cumulative real GDP per capita of 5.06%. And with that, Bush ’43 was easily re-elected. The policies of Reagan, Clinton and Bush ’43 moved America ‘forward’. That’s what I call progress – moving the economy forward in real and measurable terms. Terms that every American could see, touch and feel in their own billfolds, as real GDP per capita was spread around, lifting many from poverty and mediocrity into new realities. Why Real GDP Per Capita? Why measure GDP on a per capita basis? GDP is an aggregate figure which does not consider differing sizes of nations. Therefore, it should be stated as GDP per capita (per person) in which total GDP is divided by the resident population on a given date. Why use chained dollars? When comparing GDP figures from one year to another, it is desirable to compensate for changes in the value of money – i.e., for the effects of inflation. The factor used to convert GDP from current to constant values in this way is called the GDP deflator. Unlike the Consumer price index, which measures inflation or deflation in the price of household consumer goods; the GDP deflator measures changes in prices of all domestically produced goods and services in the economy. It is only by comparing cumulative changes in real GDP per capita that we are able to understand whether today’s economic policies are helping or hurting. Furthermore, by making the comparison in 4 and 8 year increments we are able to determine whether to re-elect a POTUS or send him packing, or to continue with the same party affiliation or make a break towards independence. So where do we stand today? Although Barack Obama also inherited a bad deal, his policies made it worse. The economy was declining at a real per capita rate of -1.27% in 2008, but by the end of 2009, Obama turned that into a decline of -4.33%. That’s a fact. Then, by the end of his second year, Obama’s stimulus programs resulted in a slight improvement, as the economy achieved negative cumulative growth of -2.15%. Although similar to Reagan’s second year decline to -1.36%, that’s where all similarities end. Now in his fourth year (as of Q1 2012), Obama has achieved cumulative real GDP per capita growth of -0.20%. Compared to Reagan, Clinton, and Bush ‘43’s fourth year benchmarks of 8.47%, 8.19% and 5.06%, Obama is clearly a first-term loser. In absolute terms, the economy has gone nowhere under Obama. In terms that really matter, inflation adjusted dollars, as a percentage of the population; the economy hasn’t moved at all under the policies of Barack Obama. We are still below zero as far as real per capita growth – below zero, in spite of $6.3 trillion of additional debt. If Barack Obama is re-elected, he will be the only POTUS in modern history to be reinstated based on driving our economy into the ground. Forward? Yes, we will be moving forward – without Obama. The distraction of rising student loan interest rates is irrelevant in a shrinking economy. The concepts of a fair shot and a fair share are inapposite and unworthy of further discussion given the circumstances. And this garbage about being the only American around capable of giving a nod to take out a dangerous radical jihadist is just that – garbage. I care about my children, my grandchildren, my parents, my sisters, my friends, my business, my customers, my community and my neighbors, but I could care less about Afghanistan. Why are Americans still dying in that cesspool? If Obama really wants to take responsibility for all of his actions, then why not include the fact that 69% of U.S. Afghan War casualties have occurred during his 39 month command? Explain that! How did Obama manage the war for only 30% of the time, 3 years out of 10, yet wind up responsible for 69% of the casualties? Between the trail of blood, death and destruction abroad and his tanking of the economy at home there’s really no reason to grant Obama a second chance. It’s time for Obama to give up the keys, stop impersonating a president, and go home. Only new leadership will move America forward. Great post here! I performed a similar analysis using chained 2005 dollars but didn't use GDP per capita and while I got similar results, they were not as dramatic as yours. The 'recovery' under Obamanomics also violates a long held economic truth that recoveries from large recessions are higher in magnitude than recoveries from minor recessions.